SAINT PETER, Minn. – The Gustavus football team is set to host No. 7 St. Thomas at 1:10 p.m. Saturday for its Senior Day. The Gusties enter the contest on a four-game winning streak at 5-3 overall and 4-2 in the MIAC, while the Tommies are 7-1 overall and 5-1 in the league. 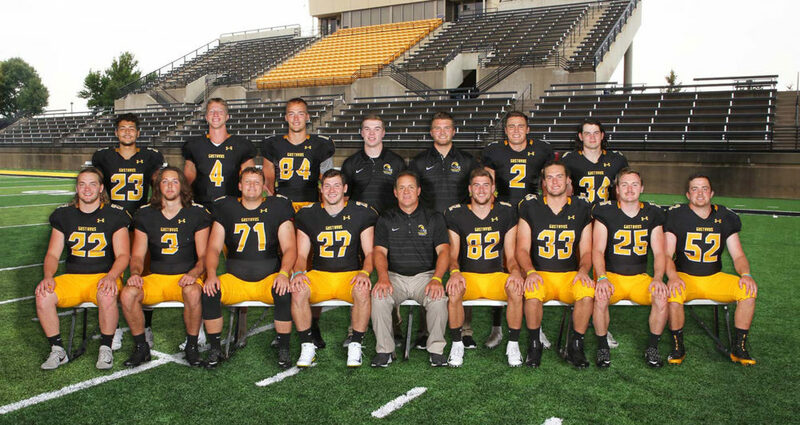 As is tradition as Gustavus, 14 seniors will be honored as part of Senior Day at Hollingsworth Field this afternoon. The Gustavus Adolphus College Department of Athletics would like to send a sincere thank you to this group of young men for their leadership both on and off the field the past four years. The seniors honored prior to kickoff include Matt Berkner (Sleepy Eye, Minn.), Jamison Beulke (Montgomery, Minn.), Dutch Claybaugh (Kaneohe, Hawaii), Michael Hensch (North Branch, Minn.), Ellis Hirman (Zumbrota, Minn.), Tommy Jech (Chatfield, Minn.), Jordan Kahlow (Le Sueur, Minn.), Sean Kelly (Shorewood, Minn.), John Krohn (Richfield, Minn.), Brady Miller (Delano, Minn.), Ben Rengel (Sartell, Minn.), Jack Sorenson (West St. Paul, Minn.), Tanner Sparrow (Edina, Minn.), and Michael Veldman (Becker, Minn.), along with student coaches Evan Jakes and Luke Schavey. Saturday’s game marks the 88th all-time meeting between the Gustavus and St. Thomas football programs. The Tommies lead the series 49-36-2 and have won the past 10 meetings. Last season in Saint Paul, the Tommies jumped out to a 34-7 lead in the first half and never looked back. St. Thomas outgained Gustavus 550-1 in total yards of offense. The last Gustie victory over the Tommies was a 30-14 decision in 2007 in Saint Paul. The last Gustie win at Hollingsworth Field was in 2003. After an undefeated month of October, Gustavus is seeking five straight wins today for the first time since the 2015 season. Last week the Gusties scored early and often, cruising to a 62-28 victory over Carleton. During the previous three games, Gustavus averaged 30 points in the first half and that trend continued with 34 first half points at Carleton. The Gusties also entered the matchup without any points in the fourth quarter and were able to end that slump against the Knights with 21 points in the final frame. Gustavus outgained Carleton 581-348 with 443 yards of passing and 138 on the ground. Both the total offensive yards and passing yards marked season highs for the Gusties. Through eight games this season, the Gusties average 30.1 points and 347.2 yards of total offense per game – both fourth best in the MIAC. They’ve moved the chains on 51-of-108 third down attempts, leading the MIAC with a 47 percent third down conversion rate. On the defensive side of the ball, Gustavus has caused 17 fumbles and totaled 650 tackles – second most in the MIAC. The return game continues to be a strength with the Black and Gold averaging 13.3 yards per punt return and 20.6 yards per kick return – both second in the league. Gustavus has proven itself to be disciplined as the least penalized team in the MIAC with an average of just 4.6 penalties per game. First-year David Peal (Worcester, Mass.) leads the rushing attack with 83 carries for 369 yards and eight touchdowns (3rd/MIAC). Michael Veldman (Sr., Becker, Minn.) has completed 58.9 percent of his passes for 1866 yards (3rd/MIAC), 14 touchdowns, and six interceptions. Brice Panning (Jr., Hamburg, Minn.) continues to be the top target, averaging 84 receiving yards per game (3rd/MIAC) and 18.7 yards per catch (2nd/MIAC). Inside linebackers Matt Berkner (Sr., Sleepy Eye, Minn.) and Jake Boykin (Jr., Las Cruces, N.M.) lead the defense with 65 and 43 tackles, respectively. Berkner’s 8.1 tackles per game rank fifth in the MIAC. No. 7-ranked St. Thomas presents a tough challenge, having won 32 of its last 33 conference games. The Tommies most recently shut out St. Olaf 60-0 last Saturday in Saint Paul. UST outgained the Oles 485-55 in total offensive yards, while the defense didn’t allow a single third down conversion. After eight games this season, St. Thomas leads the MIAC in a number of statistical categories, highlighted by points per game (56.8 – 2nd/NCAA), yards per game (509 – 9th/NCAA), rushing yards per game (306.4 – 4th/NCAA), kick return average (23.5), punt return average (18.3 – 9th/NCAA), red zone touchdowns (39), interceptions (18), and sacks (32). The Tommie defense is among the best in Division III, ranking second in rushing yards allowed per game (16.0) and third in total yards allowed per game (166). Josh Parks leads an exceptional ground game with 109 carries for 1119 yards and 17 touchdowns. He averages 139.9 yards per game and 10.3 yard per carry. As a team, the Tommies have accounted for 43 rushing touchdowns this season – 17 more than the next team in the MIAC. Jacques Perra boasts a 140.0 quarterback efficiency, completing 63.2 percent of his passes for an average of 169.2 yards per game and nine total touchdowns. Gabe Green is the leading receiver with 27 catches for 321 yards and a touchdown. Nine different Tommies have caught a touchdown pass this year. Adam Brant leads the defense with 41 tackles, 2.5 sacks, and a 40-yard fumble recovery returned for a touchdown. Matt Mitchell is next with 31 tackles, two sacks, and a forced fumble.